Apple’s original AirPods received a dismal repairability rating from iFixit, and things haven’t improved with the new AirPods either. In its AirPods 2 teardown, iFixit gave the new model a big, fat zero for repairability. iFixit gave a repairability rating of 0/10 to the original AirPods, explaining that it is impossible to open them up without damaging them. The repair firm concluded that the AirPods are meant to be disposable, meaning repairing them is out of the question. Samsung’s Galaxy Buds also did not fare well on iFixit’s repairability standards. However, the Galaxy Buds received a repairability rating of 6/10. After this many expected that future earbuds from major brands would be repairable, but unfortunately, this doesn’t seem to be the case. “We were on cloud nine after tearing down Samsung’s Galaxy Buds, which proved that wireless earbuds can, in fact, be repairable. But dissecting the new AirPods felt like teardown déjà vu,…” iFixit said. iFixit’s AirPods 2 teardown proved that anyone looking to extend the life of their AirPods 2 through do-it-yourself repairs will be disappointed. Even opening the casing of the AirPods to get to the internal components is a hard task, according to iFixit. Opening the case requires heat, alcohol and an ultrasonic scalpel to slice it open. “Our badges say Teardown Engineer, but today we feel more like surgeons, or paleontologists. Paleosurgeons?” iFixit said, referring to cutting and slicing to get inside the AirPods. If somehow the outer case is opened, all the components inside are glued, making it even more difficult to extract the components. Thus, the casing must be cut further to make progress. iFixit had a similar opinion for the charging case as well. The case had to be secured by applying heating and prying the components apart with pliers. However, iFixit adds that the new case is more durable than the one that came with the original AirPods. Both cases use the same battery to charge the AirPods. Both the original and new AirPods feature a 93 mAh battery, and the fact that they are sealed in limits their lifespan. Additionally, the AirPods’ 93 mAh battery is less than half the capacity of the batteries in Samsung’s Galaxy Buds. Apple offers a battery replacement service, but it costs $69 for a single out-of-warranty earbud battery replacement. Replacing the battery for the case will set you back $69 more. iFixit also found that the AirPods 2 have new identifiers: A2031 (left) and A2032 (right). There were separate identifiers for the original AirPods as well: A1722 (left) and A1523 (right). Further, the new AirPods weigh the same as the original model at 4 grams (0.14 oz). The new Qi charging case is 2.3 grams heavier than the original case at 40 grams (1.41 oz). Many of the new features in Apple’s AirPods 2 can be attributed to the new H1 headphone chip. It is more powerful than the W-series chips which power the original AirPods, the newer Apple Watch models and some Beats headphones. This new chip adds “Hey, Siri” functionality and support for Bluetooth 5 connectivity, which results in four times the range and double the speed of the previous model. 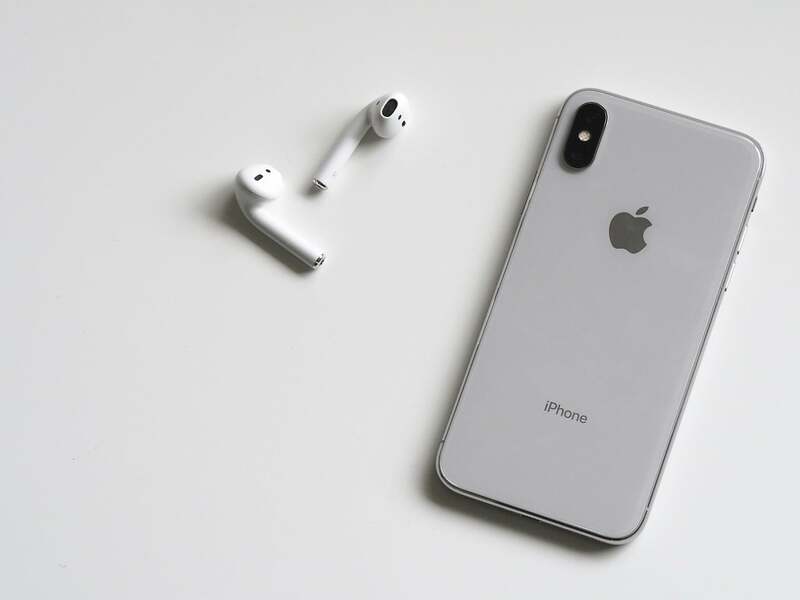 The Bluetooth 5 connectivity also leads to improved connection reliability and faster switching between devices. One point to note is that users won’t experience any of the Bluetooth 5 benefits until they pair the new AirPods with a Bluetooth 5-supported device, including the iPhone 8 and above, iPad Pros, Mac minis, and some models of MacBook Pros. The Apple devices that don’t support Bluetooth 5 are iMacs, iMac Pros, Mac Pros, the 2018 MacBook Air, the 2019 iPad mini 5 and the 2019 iPad Air. The new charging case carries the same dental floss look, but the model number is different from that of the original one. The original case came with the model number A1602, while the new one bears the model number A1938. As far as internal changes, there are no surprises. The new Qi-enabled charging case comes with a wireless charging coil. The hinge on the new AirPods case looks sturdier, and the circuit board is covered with a waterproof coating. The position of the LED status light has also been changed. On the new case, the LED light is on the case’s front instead of between the spaces in the original earbud model.